Servings: 4 as an appetizer, 2 as a main course. This recipe may look fussy, but it’s actually feasible for a weeknight. 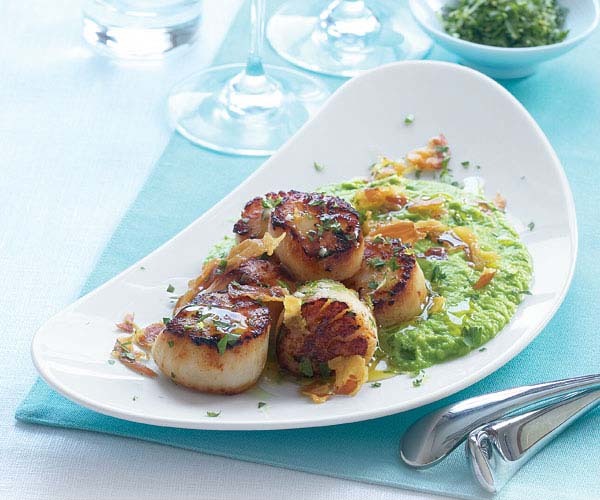 The luscious sweet pea purée comes together quickly, and the pancetta bakes while you sear the scallops. Easy and elegant, this dish is great for guests or for a special family meal. Set aside 1 Tbs. of the shallots and put the rest in a 3-quart saucepan with 2 Tbs. of the oil and the garlic. Cook over medium-low heat until the shallots are soft and fragrant but not browned, about 5 minutes. Add the peas and the broth and season with a pinch of salt and pepper. Bring to a simmer over medium-high heat and then reduce the heat to medium low. Cover the pan and cook until the peas are tender, 5 to 8 minutes for fresh peas, 3 to 4 minutes for frozen. Transfer the contents of the pan to a blender and purée to a smooth consistency, adding a little water if needed. Season to taste with salt and pepper. Return the purée to the saucepan, cover, and set aside on the stovetop to keep warm. Put the pancetta on a baking sheet and bake until golden brown and crisp, 10 to 14 minutes. Set aside in a warm spot. In a small bowl combine the parsley, lemon zest, and the reserved 1 Tbs. shallots and set aside. Pat the scallops dry and season them generously with salt and pepper. Heat the butter and the remaining 1 Tbs. oil in a 12-inch nonstick skillet over medium-high heat until very hot. 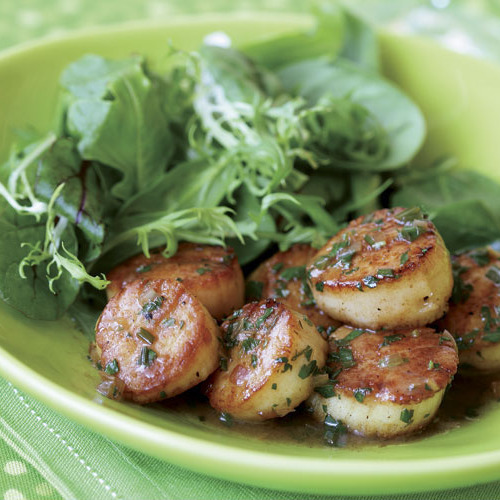 Add the scallops and cook, flipping once, until golden brown on both sides and almost firm to the touch, 2 to 4 minutes per side. Transfer to a plate. 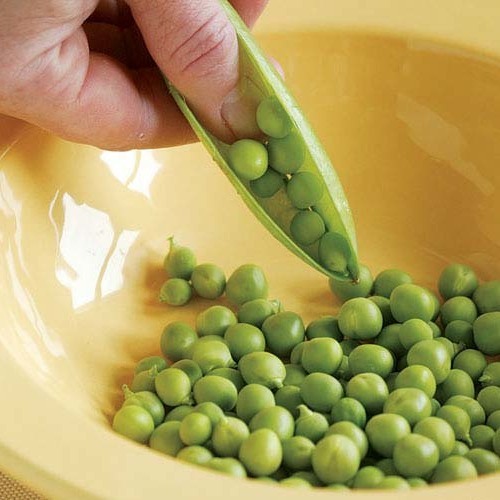 Portion the warm pea purée among four large salad plates or between two dinner plates. Arrange the scallops on the purée and crumble the pancetta on top. Sprinkle the gremolata over all and finish with a generous drizzle of olive oil. Similar to risotto, Orzo with Lemon, Garlic, Parmigiano & Herbs makes a perfect side. Really tasty! The pea puree was a little runnier than I would have liked, next time I will use 1/2 cup less broth so that it's closer to a mash rather than a liquid. Other than that, all of the flavours were delicious. My first review ever, after years of online recipe collections! The recipe deserves the recognition.. I prepared the recipe virtually to the letter, and it was flawless. The pea puree ( frozen tiny peas) was gorgeous, with a sweetness that enhanced the dry scallops (you must have dry, not preserved scallops), and the smoky pancetta added another layer of flavor. I found it quite simple to prepare, largely ahead of dinner. We poured Olivet Lane Chardonnay, perfect! Sauteed asparagus and jasmine rice - an elegant dinner! I will use this recipe for small dinner parties with confidence! This was an expensive disappointment. I bought gorgeous fresh scallops from a fish market. The puree just wasn't tasty, even though I added S+P twice. I think there was too much going on in the dish -- puree, scallops, pancetta, gremolata, olive oil drizzle. It overpowered the taste of the scallops for both my husband's and my taste.